il Vinaio is an American Wine Bistro with Mediterranean influences serving traditional American home-style Breakfasts and Lunches featuring local, freshly baked Artisan Breads, homemade soups, and locally grown organic produce. Our linens come out in the evening for an elegant yet casual dining experience featuring dinners specifically created by our Executive Chef to pair exceptionally well with our boutique wines and craft beers. Everyone can find what they are looking for from sampler platters and vegetarian dishes, to steaks, chops, pastas, and seafood. Every night is different with daily specials and a variety of indulgent desserts. View our menu to find your favorite dish. This 5000 square foot restaurant, a Historic Downtown Mesa Landmark for almost 40 years, has recently been remodeled in an old world Tuscan decor to compliment the Downtown Arts focus. We've exposed our cathedral ceiling and 70 stained glass windows, and accented the softly backlit soffit with 11 hand painted wine parables. Original art from local artists and photos of our regular customers adorn the walls as il Vinaio still features the same popular casual & comfortable atmosphere Downtown regulars have been raving about! We are passionate about our friendly, family atmosphere, fresh home-style food, and exceptional service. Check out the il Vinaio TV Spot . We are open for dinner now. Beer & Wine are being served now. New Floors reflect our vaulted ceiling. New Tables give more room and accommodate large groups, more comfortably. Come mornings to enjoy coffee on comfortable couches & easy chairs in our lounge with free Wi-Fi, or in the afternoon unwind with a cocktail. Come enjoy our new Wine Bottle shaped bar. Get information on our upcoming events such as Beer & Wine Tasting and Live Entertainment. Invite il Vinaio to be your friend on Facebook to get regular promotions and event updates. Join our e-club to receive special offers and updates on promotions. 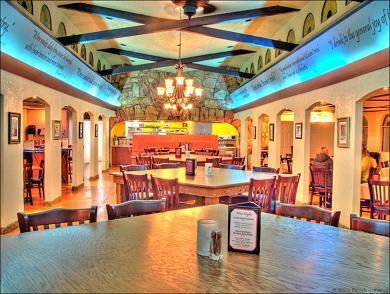 We strive to provide exceptional food and service in a comfortable, casual, family environment at an everyday value. We also are dedicated to working with the City of Mesa and our peer businesses to further develop the street scene, sense of community, and ultimately nightlife of our beautiful Downtown. In this spirit we are proud to offer you the opportunity to be involved in the development of our new and expanded format. We welcome your inputs on menu, layout, decor, and most importantly, ever improving our service to you, our loyal customers.